A memory box filled by friends and a picture collage will be delivered to Kenzie Krogh’s family. Friends remembered Krogh as selfless, compassionate and genuine. 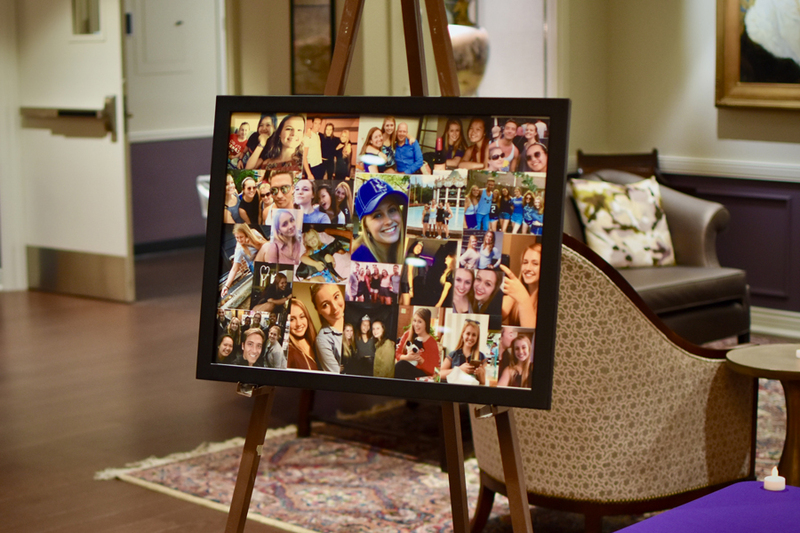 Friends and members of the Northwestern community gathered Thursday to honor and celebrate the life of Kenzie Krogh. Some of Krogh’s closest friends said they organized the memorial service to share stories and carry on her memory. They stressed her selfless compassion, saying that she would often put others’ well-being ahead of her own. Weinberg junior Danielle Hojnicki, who had been friends with Krogh since before they arrived at NU, told The Daily that Krogh’s benevolence was rooted in love and kindness. Krogh died Sunday morning after being taken to Saint Francis Hospital by her friends the day before. The Evanston Police Department’s investigation into her death could take several more weeks, though Evanston police Cmdr. Ryan Glew said no foul play is suspected. Students, staff and other community members filled the Guild Lounge in Scott Hall for the memorial, prompting staff to lay out additional chairs. Krogh’s friends said they appreciated the turnout. Weinberg senior Natasha Kulick, who described Krogh as her best friend, told The Daily that Krogh, a research assistant at at NU’s Relationships and Motivation Lab and teaching assistant at the Kellogg School of Management, was dedicated to her friendships despite her busy schedule. Despite her commitments and academic excellence, Cope told The Daily that Krogh gave “whatever she had” to other people. Hojnicki added that Krogh was often eager to make new friends, opening invitations for hangouts to friends of friends. Krogh was “very inclusive of others,” she said, and liked to be a host for others. Attendees at the memorial were encouraged to share memories of Krogh, either through an open mic invitation or by leaving a note in a memory box. The box will be sent to Krogh’s family in North Carolina, said Bienen junior Tina Zheng, an organizer of the event. “We want it to be special for them — to have those from Kenzie’s friends and people who she was close to,” Zheng said. A picture collage featured at the memorial will also be sent to the family, she said. Cope praised Krogh’s generosity, work ethic and treatment of friends and family.